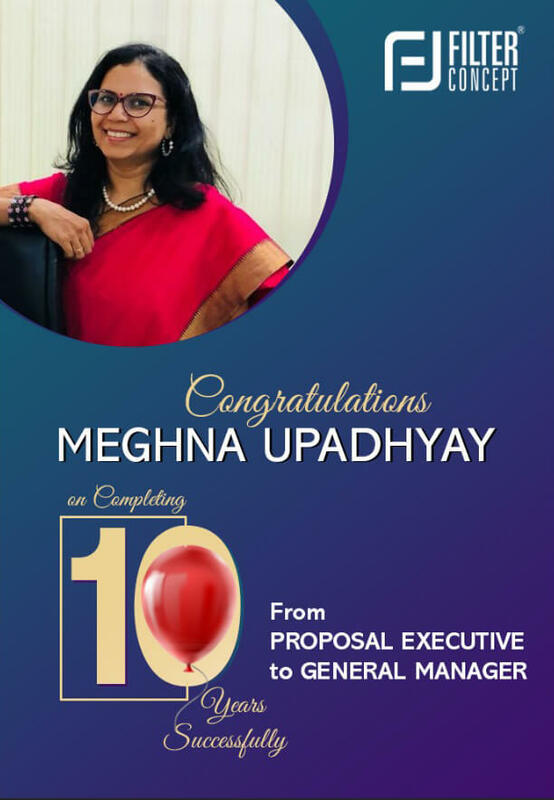 Celebrating 10 Years of Team work with Ms Meghna Upadhyay, GM of Filter Concept Pvt. Ltd. It has been a ten-year long journey for Ms. Meghan Upadhyay with Filter Concept. Ms. Meghna started as a Proposal Executive, only with a passion to work hard for something. Filter Concept recognized her zeal and we have been through thick & thin and the success that we have built together. Ms. Meghna’s sincerity and honesty to adopt new challenges and learn as she was guided by none other than Chairman & MD Mr. Mehul Panchal of Filter Concept Pvt. Ltd. have been proven to be the best asset for the company. The faith built between the team with Ms. Meghna has uplifted not only Filter concept but its team as well. Looking back at the beginning of Filter Concept as a start-up business, Ms.Meghna has adapted all business acumen and practices to understand and learn more about the industry. To deliver the Vision of Filter concept to become a frontrunner Company in Filtration business by providing world-class quality products and services to our customers and maintain the highest level of customer satisfaction, Ms.Meghna has performed each task with a mission in mind and that’s from beginning till today. Her constant push and faith in herself as well as in Filter concept have helped upscale the company to a position which it is today. Her focused drive to shape her abilities to make decisions more effective in complex business situations is still growing with the company. Throughout 10 years, Ms. Meghna has successfully delivered many assignments and projects with the best of her abilities. Even while being away from home, she was never nudged to prioritize company and its work. Also, support from her family has inspired her more to work harder. She has been an inspiration to all past and present employees of Filter Concept and has motivated many for advancement in professional career. With this milestone by Ms. Meghna in filter Concept Pvt. Ltd. We are looking forward to more added values and achievements in the years to come. Ms. Meghna’s delightful nature and positive outlook during each project were encouraging to employees around her. Her belief and dreams for the greater good of Filter concept have led our team to new heights in the Filtration industry. Ms. Meghna is the true representative of Filter Concept’s mission which is to Grow Company, its Employees, and associates by adopting advanced technology, positive attitude, teamwork & innovative approach. Her amazing persona and remarkable communications skills with company associates have built many long-term bonds and collaborations for the company. Ms. Meghna’s work ethic throughout these 10 years of long service has helped create a blissful working environment in the company as well. Her code of conduct and way of delegating each responsibility among team members has been the best in the company so far. And we also hope to build leaders like Ms. Meghna Upadhyay to lead this organization to greater heights. Ms. Meghna’s continues guidance to her team members has constructed a strong and important pillar for Filter Concept which is teamwork. Even today her abilities as general manager of filter concept are efficient enough but still stunning that it’s growing. Her wonderful nature which stays with each colleague and peers she has worked with it makes Filter Concept a proud employer. Even at hard times faced by the company, she reaffirmed the vision of the company to her team and peers to keep them moving towards a company’s mission. Due to her efforts like these, she has gone beyond the company’s expectation which is astonishing in itself. Ms. Meghna has helped many employees to identify the appropriate skills, aligning with their expertise and passion and connect the same with Filter Concept’s mission and vision. People also felt that they learned a lot of essential information that will assist them in near future. Filter concept also hopes that her motto of Keep Going and Keep Growing will lay down many more milestones with FCPL family.